So I am on the road this week, and as it turns out I may be unable to post every day. I am going to do my best of course, but fair warning that it will probably be a slow week on here. As I promised last week I am planning to provide some holiday gift suggestions. I thought it would be fun to start with the gift that keeps giving. Martha Stewart's series of encyclopedias. 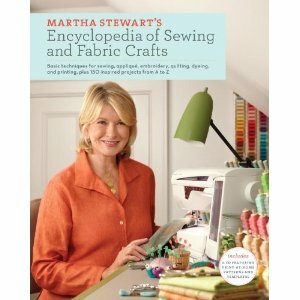 I really love the sewing book, but she also has a great craft encyclopedia too. So even if you don't buy the book as a gift, both books have great ideas for gifts you can make for your friends.